Khalid Batarfi is a U.S.-designated Yemen-based senior regional member of al-Qaeda in the Arabian Peninsula (AQAP).Oren Adaki, “AQAP Storms Yemeni Prison, Frees Jihadist Leader,” Long War Journal, April 2, 2015, http://www.longwarjournal.org/archives/2015/04/aqap-storms-yemeni-prison-frees-al-qaeda-leader.php. He is reportedly a media specialist as well as a military commander who has planned terrorist attacks in Yemen.“AQAP Militants Arrested,” Critical Threats, American Enterprise Institute, March 17, 2011, http://www.criticalthreats.org/hotspot/aqap-militants-arrested. He was formerly AQAP’s emir (leader) of Abyan, a province in southeastern Yemen.“AQAP Militants Arrested,” Critical Threats, American Enterprise Institute, March 17, 2011, http://www.criticalthreats.org/hotspot/aqap-militants-arrested. Batarfi was also reportedly a former member of AQAP’s governing shura council.Tucker Reals and Khaled Wassef, “Amid Yemen chaos, al Qaeda stages prison break,” CBS News, April 2, 2015, http://www.cbsnews.com/news/yemen-prison-break-aqap-senior-commander-saudi-bombing-campaign/. Batarfi was born in 1979 in the Saudi city of Riyadh. After graduating from secondary school in Jeddah, he studied underneath several famous Islamist scholars, including al-Qaeda linked ideologue Abu Qatada.“Who is Khalid Bātarfi,” JustPaste, July 12, 2015, https://justpaste.it/mb2f. According to a resume released by AQAP, Batarfi traveled to Afghanistan in 1999 to train at al-Qaeda’s al-Farouq camp. In 2001, Batarfi fought alongside the Taliban against the Northern Alliance and U.S. forces.“Al-Qaeda in Yemen publishes the biography of its current leaders,” Yemen-24.com, December 10, 2015, http://yemen-24.com/news20308.html. Umberto Bacchi, “Yemen: Al-Qaeda frees 300 in al-Mukalla prison attack,” International Business Times, April 2, 2015, http://www.ibtimes.co.uk/yemen-al-qaeda-frees-300-al-mukalla-prison-attack-1494697. Soon after his escape, Batarfi trampled on the Yemeni flag in the evacuated provincial palace in al-Mukalla.Umberto Bacchi, “Yemen: Al Qaeda operative Khalid Batarfi takes selfies inside Mukalla government,” International Business Times, April 4, 2015, http://www.ibtimes.co.uk/yemen-al-qaeda-operative-khalid-batarfi-takes-selfies-inside-mukalla-government-1494971. He also took photographs, including “selfies,” of himself brandishing an AK-47 inside the palace.Umberto Bacchi, “Yemen: Al Qaeda operative Khalid Batarfi takes selfies inside Mukalla government,” International Business Times, April 4, 2015, http://www.ibtimes.co.uk/yemen-al-qaeda-operative-khalid-batarfi-takes-selfies-inside-mukalla-government-1494971. 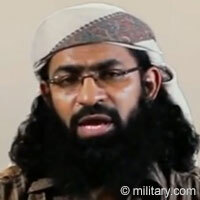 Batarfi has appeared in several AQAP videos and other propaganda. In August 2015, AQAP released a video of Batarfi praising Chattanooga shooter Mohammad Youssef Abdulazeez and condemning “America, France, and other kufr nations.”“Al-Qaida calls for more lone wolf attacks, praises Chattanooga shooter,” Chattanooga Times Free Press, August 4, 2015, http://www.timesfreepress.com/news/local/story/2015/aug/04/report-al-qaida-urges-more-lone-wolf-attacks-praises-chattanooga-shooter/318246/. When AQAP’s ideological leader Nasser bin Ali al-Ansi was killed by a U.S. drone strike in April 2015, Batarfi officially announced his death.“AQAP Leader Who Claimed Charlie Hebdo Attack Killed by U.S. Drone,” CBS, May 7, 2015, http://www.10tv.com/content/stories/2015/05/07/cbs-ap-aqap-leader-who-claimed-charlie-hebdo-attack-killed-by-u-s-drone.html. In June 2016, Batarfi issued a statement praising AQAP leader Nasir al-Wuhayshi after he was killed in a U.S. air strike that month. Batarfi threatened that al-Qaeda would target the U.S. economy, attack U.S. interests, and “destroy them.”Cassandra Vinograd and Robert Windrem, “Al Qaeda confirms death of terrorist leader in US airstrike,” MSNBC, June 16, 2015, http://www.msnbc.com/msnbc/al-qaeda-confirms-death-nasir-al-wuhayshi-aqap-leader. In June 2017, Batarfi condemned Saudi Arabia, Bahrain, the United Arab Emirates, and Egypt for severing ties with Qatar. Batarfi issued a statement of solidarity on behalf of AQAP after the four countries designated several Muslim Brotherhood- and al-Qaeda-related individuals in Qatar. Batarfi condemned the terror list as a “war against Muslims” and called all Islamic scholars, preachers, and groups to support “jihad” against “the tyrants.”Huda al-Saleh, “Al-Qaeda condemns boycott against Qatar, stands with the Muslim Brotherhood,” June 16, 2017, https://english.alarabiya.net/en/News/gulf/2017/06/16/Al-Qaeda-condemns-boycott-against-Qatar-stands-with-the-Muslim-Brotherhood.html. Abu Miqdad“AQAP Militants Arrested,” Critical Threats, American Enterprise Institute, March 17, 2011, http://www.criticalthreats.org/hotspot/aqap-militants-arrested. Abu al-Miqdad al-Kindi“Al-Qaida calls for more lone wolf attacks, praises Chattanooga shooter,” Chattanooga Times Free Press, August 4, 2015, http://www.timesfreepress.com/news/local/story/2015/aug/04/report-al-qaida-urges-more-lone-wolf-attacks-praises-chattanooga-shooter/318246/. Khalid bin Umar Batarfi“Al-Qaida calls for more lone wolf attacks, praises Chattanooga shooter,” Chattanooga Times Free Press, August 4, 2015, http://www.timesfreepress.com/news/local/story/2015/aug/04/report-al-qaida-urges-more-lone-wolf-attacks-praises-chattanooga-shooter/318246/. Khalid Saeed Batarfi“AQAP Militants Arrested,” Critical Threats, American Enterprise Institute, March 17, 2011, http://www.criticalthreats.org/hotspot/aqap-militants-arrested. “Emir of Abyan”“AQAP Militants Arrested,” Critical Threats, American Enterprise Institute, March 17, 2011, http://www.criticalthreats.org/hotspot/aqap-militants-arrested. The U.S. Department of State designated Khalid Batarfi as a Specially Designated Global Terrorist on January 23, 2018.“State Department Terrorist Designation of Khalid Batarfi,” U.S. Department of State, January 23, 2018, https://www.state.gov/r/pa/prs/ps/2018/01/277593.htm. Khalid Batarfi is a U.S.-designated Yemen-based senior regional member of al-Qaeda in the Arabian Peninsula (AQAP). “Groups of Afghan Mujahideen have emerged from the land of Afghans that will destroy the biggest idol and head of kufr of our time, America.”Thomas Joscelyn, “Senior AQAP leader added to US terror list by State Department,” Long War Journal, January 23, 2018, https://www.longwarjournal.org/archives/2018/01/senior-aqap-leader-added-to-us-terror-list-by-state-department.php. “The Muslims inside the occupied land must kill every Jew, by running him over, or stabbing him, or by using against him any weapon, or by burning their homes.”Callum Paton, “Al-Qaeda Calls for Muslims to Attack Americans and Jews Over Trump’s Jerusalem Decision,” Newsweek, January 23, 2018, http://www.newsweek.com/al-qaeda-calls-muslims-attack-americans-and-jews-over-trumps-jerusalem-787800. “Let them [Muslims] rise and attack the Jews and the Americans everywhere … No Muslim has the right to cede Jerusalem no matter what happens … Only a traitor would give it up or hand it over.”Callum Paton, “Al-Qaeda Calls for Muslims to Attack Americans and Jews Over Trump’s Jerusalem Decision,” Newsweek, January 23, 2018, http://www.newsweek.com/al-qaeda-calls-muslims-attack-americans-and-jews-over-trumps-jerusalem-787800. Calls on all Islamic scholars, preachers, and students of theology and all factions of Islamist groups to “incite and encourage the jihad and dismiss nationalist patriotic sentiment…We advise all of those who flattered the tyrants and justified their crime to fear God and regret their actions. The tyrants don’t believe in the channels of communications.”Huda al-Saleh, “Al-Qaeda condemns boycott against Qatar, stands with the Muslim Brotherhood,” June 16, 2017, https://english.alarabiya.net/en/News/gulf/2017/06/16/Al-Qaeda-condemns-boycott-against-Qatar-stands-with-the-Muslim-Brotherhood.html. “[ Al-Qaeda will] target your economy … attack your interests and destroy them.”Cassandra Vinograd and Robert Windrem, “Al Qaeda confirms death of terrorist leader in US airstrike,” MSNBC, June 16, 2015, http://www.msnbc.com/msnbc/al-qaeda-confirms-death-nasir-al-wuhayshi-aqap-leader. “And as you put limits to freedom of expression and punish whomever goes against them, it is upon us to punish whoever transgresses out boundaries and sanctities.”“Al-Qaida calls for more lone wolf attacks, praises Chattanooga shooter,” Chattanooga Times Free Press, August 4, 2015, http://www.timesfreepress.com/news/local/story/2015/aug/04/report-al-qaida-urges-more-lone-wolf-attacks-praises-chattanooga-shooter/318246/.